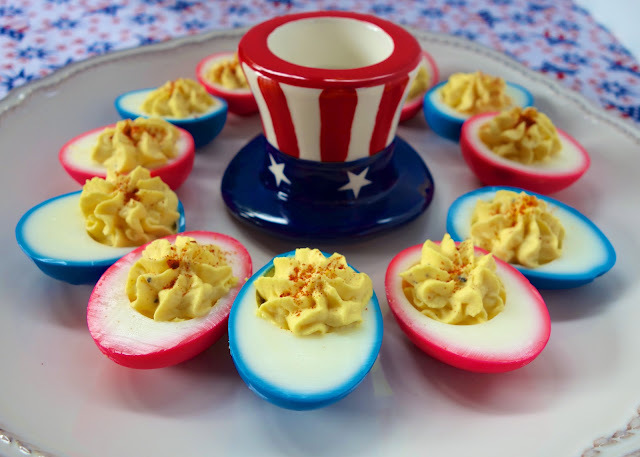 Patriotic Deviled Eggs - CRAZY good deviled eggs. Eggs, mayonnaise, vinegar, salt, dry mustard, pepper, onion and paprika. 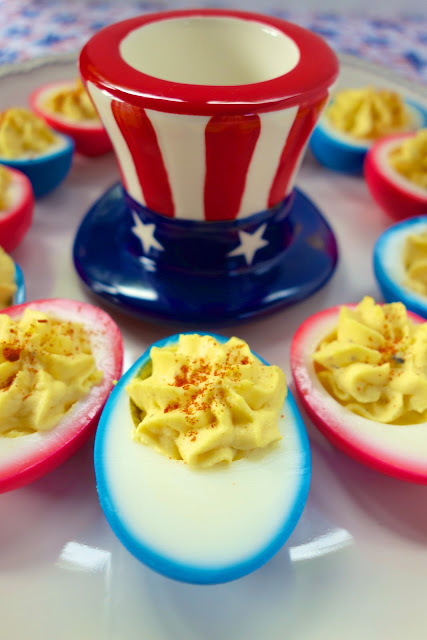 Dye the hard boiled eggs red and blue for a fun patriotic snack! Aren't these Red, White and Blue deviled eggs cute?! I saw a few blog posts around Easter for dyed hard boiled eggs. I thought they were so cute. I decided to give them and try for the 4th of July. They looked and tasted great! These deviled eggs would be a great addition to your holiday BBQ next week. The dying process is very simple and doesn't require any vinegar. It requires only three ingredients - peeled hard boiled eggs, water and food coloring. I let the eggs sit in the dye for about 2 hours and then sliced them for deviled eggs. They had a great ring of color around the edge of the egg. I thought they looked great! The possibilities are endless! I am already planning on some orange and blue eggs for the upcoming football season. Have fun with it! To hard boil eggs: place eggs in a large saucepan and cover with water. Bring eggs to a boil. Cover and remove from heat. Let sit for 10 minutes. Drain eggs and cover with ice water. Peel shells off of eggs once cooled off. To dye eggs: place eggs in a container and cover with water. You will need 20 drops of food coloring per 1/2 cup of water. Measure water that you pour over peeled hard boiled eggs and add the appropriate amount of food coloring. Allow to sit in food coloring mixture for 2 hours. Remove from food coloring and dry off. Deviled Eggs: Slice hard boiled eggs in half. Remove yolks and mash. Add mayonnaise, vinegar, salt, dry mustard, pepper and onion powder. Stir well. Pipe yolk mixture into egg white halves. Sprinkle with paprika. Store in the refrigerator. Thanks for sharing! Can't wait to make them. Also love the idea for football too! Beautiful! Thanks for sharing this idea with me:) Have a blessed day, HUGS! These look so cute. From your experience in making these...How do they hold up refrigerated, does the food coloring melt off or anything? I want to make, but I have to travel with them, and worry about the color melting off from being damp in the cooler? Just my paranoia probably,lol!! cajuncutie - the color did not melt off when I refrigerated them. The color penetrates the egg white. I didn't have any issues. You should be fine to take them to a party. Quick question--did you use your Bledtec to mix the filling? I tried making deviled eggs recently, and my Blendtec wouldn't blend. I just stirred the filling by hand - it only took a minute. I think a hand mixer would work fine too. a ziploc bag to mix the yellow egg mixture works great, then pipe with a frosting tip.